This map is adapted from Map 1.2, in FAO (1972), itself based on work by V.G. Borogov et al. (1968). It represents the biomass of zooplankton in the upper 100 m of the water column, in mg·m-3 (presumably wet weight). Bogorov, V.G., Vinogradov, M.D., Varonina, N.M., Kanaeva, I.P., and Suetova, I.A. 1968. 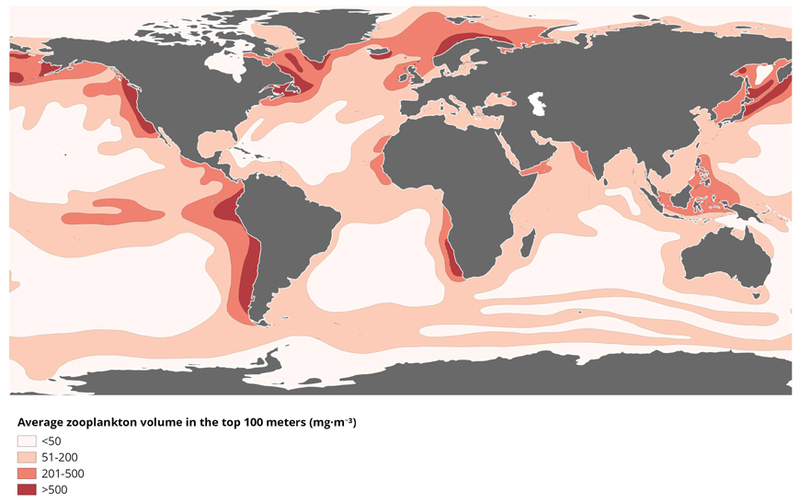 Distribution of zooplankton biomass within the surficial layer of the world ocean. Dokl. Akad. Nauk. USSR, 182: 1205-1207. FAO. 1972. Atlas of the Living Resources of the Seas. Department of Fisheries, Food and Agriculture Organization of the United Nations, Rome.